Charging according to the accessory position. Compatible with audio and video output for all iPods. Compatible with the updated video output for iPods having capability for video output. Audio and Video from Dock connector of the iPods convert RCA level output with composite video. Compatible with the audio output for the current iPods. Audio output from Dock connector of the iPods convert RCA level output. 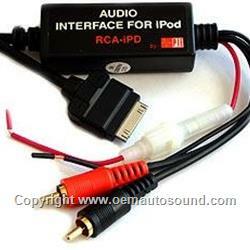 Provides a RCA level output for use with any aftermarket or OEM auxiliary input port. Single docking connection to iPod for charging. The AV-iPD and RCA-iPD do not have the capability to control any of the iPod function. All iPod control is done through the iPod click wheel directly. The volume control is done through the connected head units. The head units connected with AV-iPD and RCA-iPD,should have a RCA level input port. The video output is available with the iPods that have capability to play video.